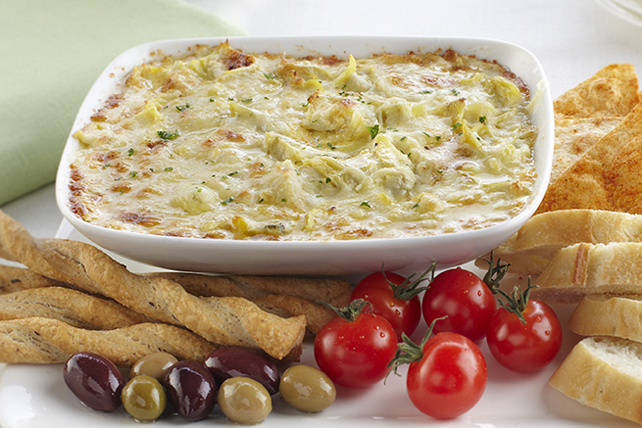 This delicious cheesy hot dip comes together in no time. And although it's delicious as is, it also lends itself to endless variations by experimenting with different combinations of CRACKER BARREL Shredded Cheese and/or RENÉE'S Dressing varieties. Spoon into casserole dish sprayed with cooking spray. Arrange crostini and/or breadsticks on platter; garnish with cherry tomatoes and olives. Serve with the hot dip.